Chef’s tip: Homemade broth is best but if you do not have access to a quality, flavorful broth you can add fresh oregano and/or basil to help kick the dish up a notch. Prepare all of the following risotto ingredients. Grate 1 cup of cheese. Finely mince your shallot and set aside. Smash and chop your garlic cloves and set aside. Chop up your beet greens and set aside. For your vegetable broth, place in a separate stock pot and heat to a medium temperature. This is a key step and remember to always keep your broth at the same temperature that you cook your rice. In a large saute pan (preferably something with a thick bottom so you don’t burn the rice) heat your butter and olive oil on medium/low heat. Using a really good quality butter will make a huge difference in how your risotto tastes (in my personal opinion) so stick with a good pasture butter like Kerrygold, Organic Valley or some nice homemade butter from your local farm. Add your rice and minced shallots and cook (stirring frequently) until the rice is transparent and very lightly toasted. This should take around 3-4 minutes. Now we add the wine and chopped garlic and red peppers. Gently stir the rice, wine and garlic until the wine is well absorbed by the rice. At this point, we begin adding the broth. TWO ladles at a time. Add two ladles of broth and STIR your risotto constantly until the broth has been absorbed. Once that happens, you can add two more ladles of broth and repeat. Risotto is made by adding broth slowly over a period of time. Adding too much liquid at one time can make your risotto turn out runny and that's something Gordon Ramsey yells at people for. Yikes! 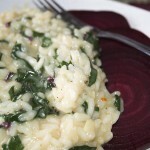 When your rice is CLOSE to al dente, add your chopped beet greens and continue to stir. It should take a few more minutes until you're close to being done. Once your rice is AL DENTE, remove from the heat and add your cheese. Stirring well until all of the cheese has melted and is incorporated into the dish. Add salt and pepper to taste The final product should look creamy and firm but not runny. Enjoy!